“Bye mum, love you,” Daughter 2.0 calls from the front door as she leaves the house in the morning. “Give me a kiss,” I call back. I’m upstairs in the kitchen. “Can’t, I’m late,” she yells. Bam goes the front door. I look at the clock. It’s 7:02. She has to be at school in her seat in class at 8:10. It’s, at most, a twenty-five minute drive from our house to school at this hour. For the record, this is the girl who tortured her sister most of last year, hardly able to get into the car by 7:20, which she would complain was far too early to be leaving for school. Daughter 1.0 liked to be at the front door when it was unlocked at 7:30. Daughter 2.0 claimed she liked to arrive with just enough time to have her bottom hit the seat as the bell rang. Why the change? Maybe it has to do with the roles we take on, the parts we play. Daughter 1.0 was the type-A, over anxious, super studious one. Daughter 2.0 was the distracted, mellow, devil-may-care one. With Daughter 1.0 away at college, Daughter 2.0 has the luxury of trying on other personas. At the moment she is must-be-to-school-early girl. It’s not a bad thing. Daughter 2.0 drives herself to school. I watched this morning as she pulled away from the curb, front windshield not quite completely defrosted, and hoped she would make it the six miles to school safely. These six miles include the 101 freeway and many grouchy morning commuters. I say a quick, tiny, silent prayer (please Universe let her make it safely) and put it out of my mind. I have to put it out of my mind. If I start down the path of what ifs I might never let her leave the house. Daughter 1.0 certainly wouldn’t be away at college. I’d have her living home and I’d be ferrying her to and from someplace local where I would wait outside for her classes to be done. Or better yet park the car and walk her to each class, after of course bringing Daughter 2.0 to high school and walking her to the front door and reminding her not to leave the building until I came back to pick her up. Oh, and do they have a lock on that front door and a security guard to keep the kids in and the bad people out? See, if I start down that path I would just become a crazy person. So I let them go and trust to the Universe (and their own good sense) that they will survive. The college to which we have sent Daughter 1.0 has a parent’s association Facebook page. Recently a mom posted about being worried because her daughter had gone to Hillel for Rosh Hashanah and hadn’t texted to say she was safely back at her apartment. (We found out later that in fact she was just fine, had merely forgotten to turn the ringer back on on her phone.) The replies to the post were mostly reassuring – lots of kids were at Hillel, nobody walks home alone, she probably just fell asleep and forgot to text …. Many people suggested that her daughter have some kind of tracking for her phone so the mom could verify her location when the daughter wasn’t responding. Ok, full disclosure, I have this tracking ability, I call it my Mrs. Weasley app. 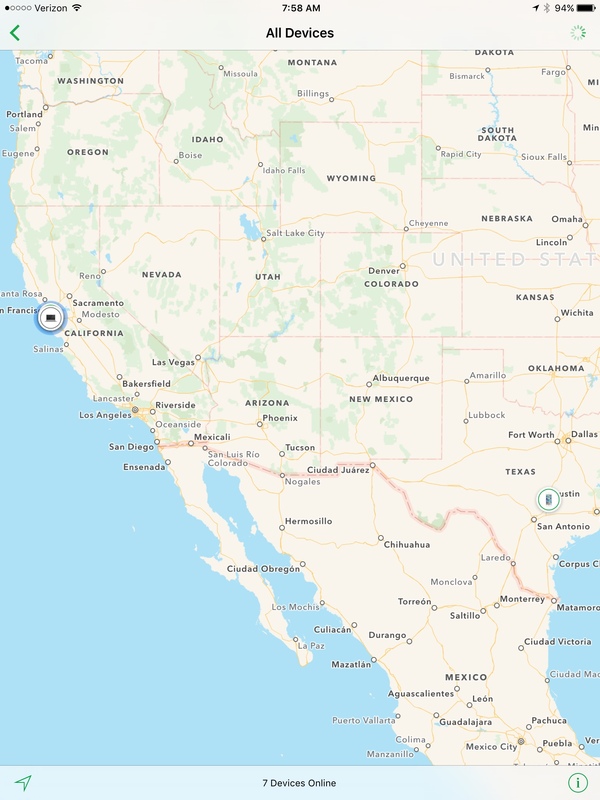 Apple calls it Find My iPhone. I log in and can see the location of each of my devices as well as the devices of each of my family members. Handy! I try to use it sparingly, like when my Husband says he will leave work at 7:00 and I’m trying to decide whether to put the pasta in at 7:30 and I look and see he hasn’t in fact left the office yet … or when Daughter 2.0 is driving back from Redwood City on 101 at 10:30 at night and she hasn’t driven on the freeway before at night and I watch her little phone icon moving north towards home … or when Daughter 1.0 was driving with a group of friends over highway 17 to Santa Cruz and I wanted to be sure she made it in one piece. Ok, so maybe I abuse this power a teeny bit. I really try not to. Like right now, my fingers are itching to pick up my phone and see that Daughter 2.0 has in fact made it to school. I will resist. What in the world did our parents do without the ability to immediately pinpoint our exact location? Oh right, they gave us a curfew and got mad when we broke it. They let us go out into the world not knowing where we were each second and as long as we made it home on time all was good. They let us go to college and spend an entire week without communication (remember having to make long distance phone calls only in the evenings and on weekends because the rates were cheaper?). They certainly couldn’t look up what we ate for breakfast with a keyboard stroke (parents can do that now). When Daughter 1.0 went to college I asked her to text once a day with at least an I’m alive. “Once a day?” my much more sensible friend asked. “Yes,” was my feeble response, “just so I know she’s alive?” My sensible friend did not point out that that seemed a bit unreasonable, given that Daughter 1.0 is 19 years old and in college. My sensible friend is also my kind friend and so she just nodded and smiled and didn’t call me a lunatic. When I told my other friend, the one who just took her son to college half way across the country, of our once a day text plan she thought it was brilliant. She suggested it to her son. “Why would I do that?” was her son’s response. “I can’t commit to that mom. Besides, if something happened to me, the school would let you know.” True enough. So far I haven’t had to worry about getting a once a day text. I get texts and Snapchats and phone calls, usually multiple times a day. We Facetime so I see her and she feels not so far away. We joke that when Daughter 2.0 heads off to college we will be lucky to hear from her at all. But then again, we were wrong about the whole leaving for school early thing, so who knows. I make a chili that my Husband and I love with flank steak and black beans and lots of hot chile peppers. My kids have never liked it so I will often make a separate kid-friendly batch. This week my Husband was away so I only made the kid friendly kind (for the one kid left at home). Sauté in canola oil the onions, garlic and jalapeño in a large sauce pan or dutch oven over medium low heat until soft but not browned. Add the ground beef and turn up the heat to medium high stirring and breaking apart the beef until it is no longer pink. Stir in the chile powder, paprika and salt and cook for 5 minutes, scraping the bottom of the pan periodically. Add the tomatoes and their juice and bring to a boil. Reduce the heat to low and cook until the tomatoes are broken apart and the chili flavors are well melded, about 30 minutes. Stir in the optional beans at this point and heat from a few more minutes. Serve with grated cheese, chopped onions, fresh cilantro, sour cream, fresh lime squeeze, whatever you like.